This weekend I had the awesome opportunity to fly down to Nashville for the first time. I’ve done some traveling lately, but all to cities I’ve been to before. I was excited for a lot of reasons, but mostly because I would be running my third half marathon, the St. Jude Country Music Rock and Roll Half Marathon. 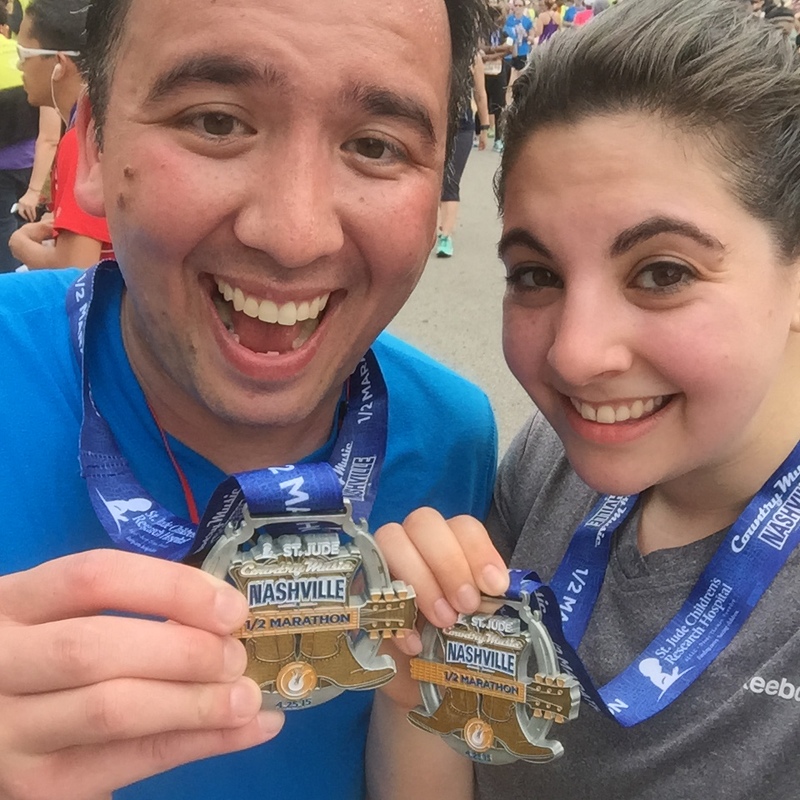 This Marathon/Half Marathon is part of the Rock and Roll series, which takes place across the country, and offers extra swag to those who participate in a specific sequence of events within a calendar year. The concept is simple. Pick a city (anywhere in the world), and run through a bunch of concerts. Naturally, being in Nashville, it was country. I was anxious the day before the race, like I always am. I was especially anxious because I had really slacked on my training in the two weeks leading up to the race; running a furthest distance of 9 miles…almost a month ago. I was counting on the energy of those around me and the event itself to carry me through, but then I slowly began to learn about the hills on the course. I heard horror stories, making me more anxious. Of course, the day before the race was also the runner’s expo, which is weirdly something I enjoy probably more than most people. I generally don’t end up buying anything at the expos, but I like to look around and get free samples of food or other small items. This expo was great for free stuff, let me tell you! Free mini-backpacks from Publix, samples of power bars, juices, and other awesome foods, and I grabbed some energy-beans that I could use the next day. I also dropped some serious cash on some (discounted, yay) socks, a new long sleeve running shirt, and a new Spibelt, but I was ok with it. Happy early birthday to me. I went to bed early after a carb-load of delicious mexican food, and couldn’t sleep. I was worried about the weather, and running lists in my head of what I needed, even though every single item was neatly laid out on the bed next to me as I slept. I slept for what felt like a minute, and was woken up by my alarm at 4am. Anxious still, I got ready, checking the weather again. It seemed as though the threat of a thunderstorm (and canceling the race) was less likely, but rain was still a possibility. As long as it wasn’t a tornado, I felt I could handle it. We made our way to the designated parking area, scoring an awesome spot, and checking the radar. The storm had already traveled past us, and we were seeing the last remnants of it; small raindrops. It looked like we were in the clear. I couldn’t believe it. After a long while of walking around, stopping to have our photo taken by event photographers that were crawling around the start area, and taking some of our own pictures, we headed close to the start line as the sun was rising and it began to get warmer and humid. We headed to our corral, and waited as speakers blasted with country music and the DJ’s chatting about the event. Finally, nearly 45 minutes later, we were up at the start line. Sun was shining, no rain…and we were off. warning. first world problem ahead. if you do not want to read, skip this paragraph. I had made a last-minute decision to use my Apple Watch, for the first time ever, to track my run. I had tested out the Nike Running app the day before, but just to see if it would start up. I had never actually run with it, but it started fine, and I had learned how to pause, end, check my pace, etc. I thought I was set to go. The DJs counted down, the gun shot off, and I started to trot. I pressed start, just as I had the day before, and it was waiting…and waiting….and waiting. A minute or so had gone by, and nothing. I panicked. My trusty Garmin watch was sitting on my bed at the hotel. I was incredibly frustrated. I rely on my watch to motivate me, keep me on track, and keep me on pace. Without it, my run would be a mess. I knew it. I quickly switched to the Apple Watch workout app, now off by about .3 miles and an unknown number of minutes, and also giving me an overall pace, and not a current pace. I felt lost the entire race. Every time I looked down at my watch I swore to myself I would figure out the problem. I still have no idea why my run never started when I needed it to. Looking back, the race whizzed by, faster than a half marathon, or any longer run, has ever gone for me. All of a sudden I was at mile 8, telling myself that I had 5 miles left. of course, miles 8, 9, and 10 all secretly have an extra half mile built in to them to make them drag, but even still, it felt fast. I saw so many different sides of Nashville, peppered with country music along the way. I was under the impression that I would be seeing more performances than I did, so I ran without headphones. Even without my music to make time pass, the race is a blur. Nashville was strikingly diverse; at least, the course was. We were in the middle of downtown, then suddenly passing colleges, then suburban areas. It was great. Aside from the hills. Everything was awesome except the hills. These hills were nothing like I had ever run. It was constant. We made it to the top of one hill, rolled back down it, made a turn, and then were introduced to another hill. My shins are going to be screaming tomorrow. As I mentioned, the race whizzed by. Suddenly, the 12 mile marker appeared. It felt like it came out of nowhere (which, it did because my watch was so drastically incorrect), and I started to get emotional, like I always do. I thought about everything I had done these past few months to get to this point. The times others pushed me because I couldn’t do it myself, the times I gave up, and the times I went so far beyond what I thought I could do. My list of thank you’s never seems to get shorter. I have an incredible number of people who have supported me as I worked to achieve this goal. My parents, my friends, and the rest of my family; even the people who like my Facebook photos or leave “great job” comments. They push me further than I think I can go, and support me when I can’t push any more, or want to give up. 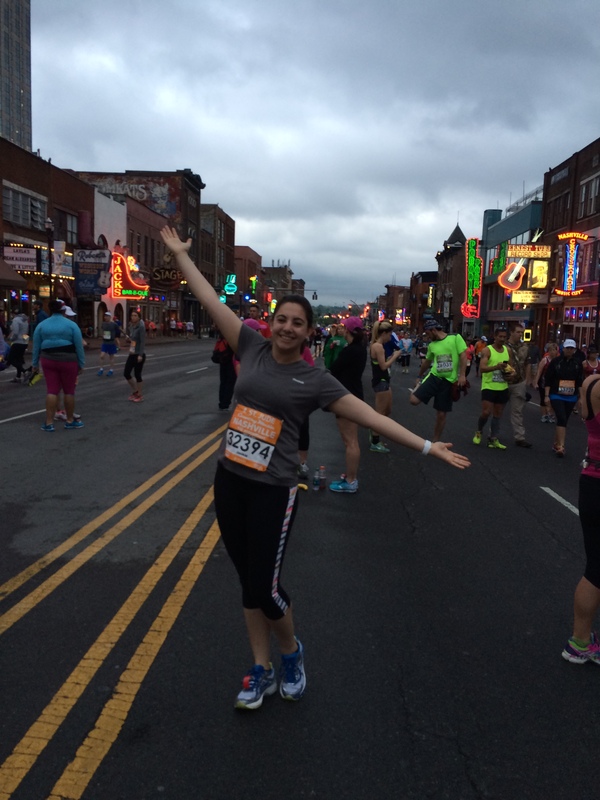 A year ago, I had never run a half marathon. I had never run this far, and had just begun my running adventures. Now, I’ve completed my third. I learned how to push myself, but it didn’t come easy. It came with tears (lots), frustration, disappointment, injury, and feelings of hopelessness. Running is physical, but more importantly, it’s mental. I could have let running beat me. I could have let small injuries keep me from ever trying again, but I didn’t, thanks to my amazing supporters. For now, I don’t have any more plans to run another half marathon. I am focusing on shorter runs, 5K-10K, to strengthen my legs, avoid injuries, and enjoy running again. Even though, I’m sure, I’ll get roped into another one soon.